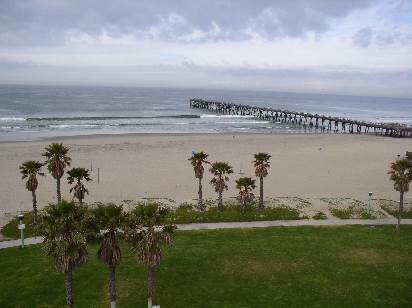 The only beach in Port Hueneme is Hueneme Beach Park. Its pretty big though, 50 acres, lots of picnic tables, barbecue pits, a 24 hour fishing pier, sand volleyball courts, lifeguard protection, walking paths and the stately Alaska Air Flight 261 memorial sundial. This is the home of the Pacific Seabees - Naval Construction Battalion Center and the home of the largest Ventura County employer in the U.S. Navy-Naval Base Ventura County. It is the largest deep-water harbor between Los Angeles and San Francisco. The Point Hueneme Lighthouse was built in 1941 and is owned by the U.S. Coast Guard. On the 3rd Saturday of the month from February thru October, the lighthouse is open for tours. 10am to 3pm. The last tour is at 2:30. Admission is free. Hueneme Historical Museum is open from 9am to 3pm Monday thru Friday. Tours are by appointment 805-488-2023 You'll find historical artifacts, photographs and information on the history of Hueneme. There really isn't a whole lot going on in Hueneme and I certainly wouldn't consider it to be a vacation destination. Just sayin'. These links will take you to the trip advisor website where you'll be able to read the reviews and compare prices. trip advisor scans through tons of hotel booking sites to find the best deals possible. Reading the reviews is so important. I think people are pretty honest when it comes to writing reviews. Just because the pictures might look nice, doesn't mean the hotel is! Browse events in your city at up to 50% off!